Review sleeping arrangements, private amenities, and much more by clicking on the individual Alpine Greens property listing of your choice! Make an instantly confirmed booking by clicking the "reserve now for instant booking" button on the individual property page. Snag more value for your money by booking directly with property owners and avoiding the middle agent fees. Click on an individual listing below for more information on that specific property. Alternatively, view our Alpine Greens Whistler Review, for a more in depth look at the development's pros & cons, location accessibility, and suitability. Read all about the Alpine Greens townhomes in Whistler, what amenities the townhomes have, how accessible they are, who they are most suitable and how close to the village is the Whistler Alpine Greens. 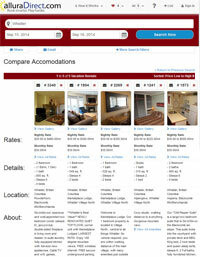 Accommodation in Whistler by Development - view all Whistler developments. Whistler Accommodation Resources - Visit our Whistler lodging resource centre for booking tips as well as standards & guarantees. Search all Whistler Accommodations - Take advantage of our powerful property search tool to find exactly what you're looking for. Alpine Greens Whistler Homeowners - List your Alpine Greens Rental! With an internet connection and minutes a day, you can take control and self-manage your Alpine Greens rentals. Forget about expensive commissions and not being able to stay in your unit during the best times of the year. Rather than charge commission, AlluraDirect.com charges a yearly subscription fee. We'll provide you with online tools, services, as well as business and marketing tips that'll help you capture more business from all of your marketing channels. Learn more about how to take control of your Alpine Greens Whistler vacation home or contact us to learn more.